Mavic has a long and colorful history in cycling. From first introducing aluminum rims to the Tour de France in 1935 to venturing into carbon fiber spokes a few years ago, they seem to be at the forefront of what makes us riders move fast. 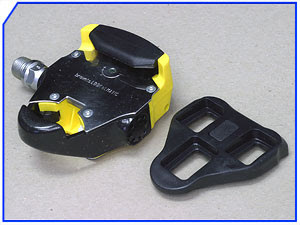 Mavic may believe its cup has overflowed and now wants to seek business in other areas, which is probably why they are rumored to introduce a new set of clipless pedals that will apparently be compatible with Look's Keo Cleats. A pair of the steel-axle version is said to weigh 288 grams. But why were their earlier pedals discontinued (the 646's licensed by LOOK) ? Interestingly, they are also set to go into their own line of cycling footwear,apparel and accessories for 2009. Whether the pedals will hit the markets then remains to be seen. Watch this neat video from Mavic's J.P Mercat (Head of R&D) on the engineering behind the R-Sys wheelset. We also hope he has a peek at the failure page.